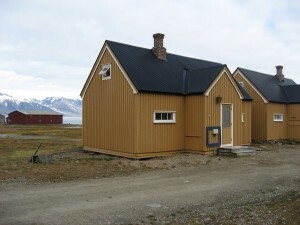 Since 18 June 2008, this house is the second part of the Netherlands Arctic Station. The four London houses were moved from Ny-London on the other side of the fjord. They were used for family housing. From 2005 to 2007, this hut was used for housing of Kings Bay personal. In 2008, it became part of the Netherlands Arctic Station. See here.